Committing to a regular fitness schedule when you’re juggling a family, work and a commute is hard. After you’ve got everyone out of the door and done a hard day’s work, also, battled traffic and catered for your family, let’s face it you’re too tired to think about exercise. Here’s where online personal training/remote fitness coaching can help. With online personal training, you can workout at a time and a place that suits your busy lifestyle. Unlike impersonal fitness apps, with remote coaching, you’ll also get the benefit of my virtual support, and motivation. “Working with Bronwen via TrueCoach has been a revelation. After being diagnosed with fibromyalgia at the age of 45 I knew instinctively that I needed to get myself to a better state of physical health in order to best cope with the potential symptoms, but I felt utterly overwhelmed by the prospect. Following our initial 1:1 assessment Bronwen devised a plan that targets my mental as much as my physical health, with daily goals for mindfulness and exercise. And each day of the week is different, as the whole plan is tailored to my variable self-employed working life. Working with Bronwen has generated a great deal of motivation and positive association with my physical targets, replacing my earlier overwhelm – I look forward to the physical challenges going up incrementally as my fitness improves, and feel safe and supported knowing that Bronwen will be making these changes based on her extensive professional knowledge and also with reference to all the info and detail she has gleaned about me through our time together and our ongoing conversations via Truecoach. What is online personal training/remote coaching? It’s personal training delivered directly to your pocket by way of a smart app. Who can benefit from online personal training/remote coaching? Anyone who wants to get fit, but lacks time to attend regular classes or personal training sessions. I create training plans according to your fitness level and fitness or health goals. Why choose online personal training/remote coaching over other options? If lack of time is stopping you from achieving your fitness goals, then remote coaching provides the answer to the problem. You can train whenever and wherever suits your schedule. But that’s not all. Remote coaching gives you the motivation you need in between training sessions to make fitness part of your routine. You see, I’ll keep you accountable for your training plan. Because, if you’ve got someone supporting you and giving you the gentle push you need during the week, then you’ll more likely achieve your goals. You can use my remote coaching app to provide me with commentary on your workout. What’s more, you can upload videos of yourself carrying out exercises. In return, I can provide feedback and words of encouragement and support. The beauty of online personal training/remote fitness is you do not need to go to a gym. I’ll create weekly fitness plans you can follow wherever you are. At home, in the office, or on the go. How does online personal training/remote coaching work? Your journey starts by completing a questionnaire. Once I’ve reviewed your answers, I’ll follow up with a 30-60 minute Skype consultation to discuss your answers. We’ll also chat about your fitness goals. Then I’ll ask you to complete a self-assessment. You’ll receive it via TrueCoach, my preferred personal training app. Don’t worry. It will be easy to follow, as I’ll include written guidelines and video demonstrations. After that, I’ll prepare an online personal training programme, to meet your specific goals. Your 6-week coaching programme is based on your individual needs. You can access it via my TrueCoach personal training app. I’ll send you a daily email. 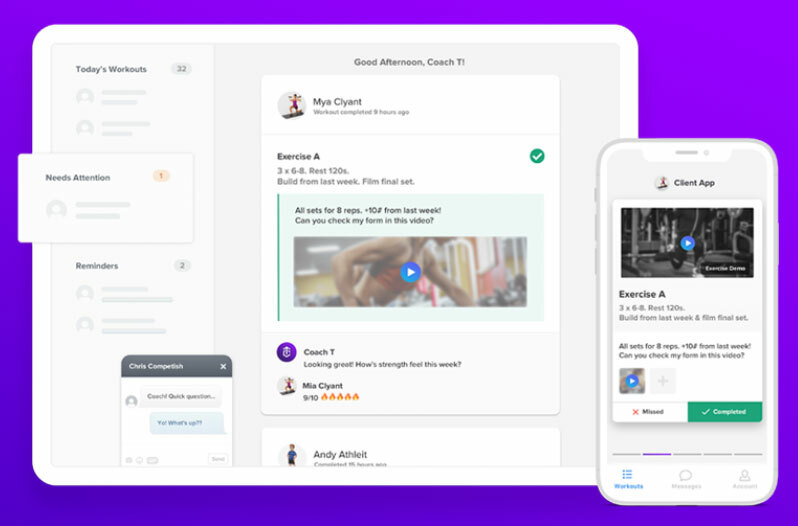 Each email will contain an outline of your day’s workout. Unlike impersonal Internet fitness apps, you’ll work at a level best suited to your individual needs. Plus, you’ll be at less risk of injury, because you’ll know you’re completing movements correctly. You’ll get support seven days per week via TrueCoach and/or WhatsApp. And we’ll review your original self-assessment quarterly. With my motivation and ability to keep you accountable to your training plan, and your dedication, you’ll soon see a demonstrable improvement in your fitness. To see the benefit of online personal training/remote coaching, I ask you to commit to a minimum 3-month programme. The cost is £175 per calendar month. “I first got in contact with Bronwen about Remote Coaching in late summer 2018. I had just returned from a family holiday and not only was I the heaviest I had ever been, I also felt extremely unfit. Bronwen took the time to understand my short and long term goals, pre-existing health and fitness issues along with my work and personal life commitments to fit a plan into my existing schedule with minimal disruption. By taking a truly collaborative approach, Bronwen has helped make exercise fun by understanding what I do and don’t enjoy, building workouts that I find both challenging and rewarding. In the space of just 3 months, I have seen a massive improvement to my weight, body measurements and overall fitness. I am stronger, faster and have noticeably more stamina during bike rides, runs and Strength Sessions.